Tel Aviv: Reverberations within Israel from Monday's deadly raid on the Freedom Flotilla are thrusting an unknown Arab-Israeli parliamentarian into the spotlight. 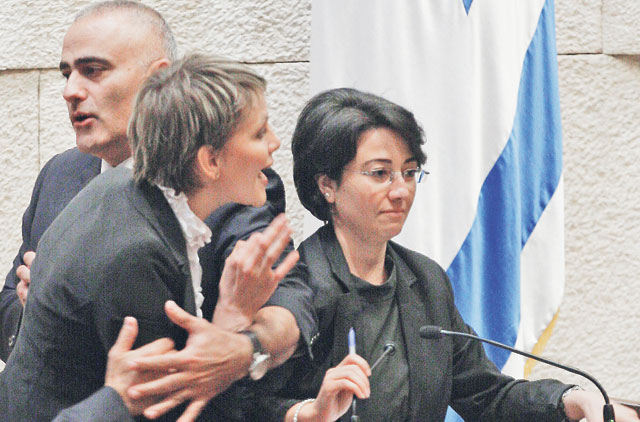 Freshman Knesset member Haneen Zoubi has emerged as a leading domestic critic of her government, calling their military operation "criminal." "She is becoming a star even though she has a reputation for being quiet,'' says Saed Adawi, an editor at the Israeli-Arab Kul Al Arab online news site. Zoubi was aboard the Mavi Marmara, one of six ships in the Freedom Flotilla that attempted to break Israel's three-year blockade on the Gaza Strip and bring in 10,000 tonnes of humanitarian supplies. She was detained, along with more than 600 others, when Israeli naval forces rerouted all six ships to Ashdod port. Zoubi was released from police custody on Tuesday because of her parliamentary immunity. Yesterday, she addressed Israeli parliament in a fiery speech challenging Israel's narrative that clashes were started by club-wielding activists. "Israel spoke of a provocation, but there was no provocation," she told the Knesset. "Why does the government of Israel oppose an investigation?" Her address to the Israeli Knesset was repeatedly interrupted by Jewish lawmakers, calling her a traitor and shouting, "Go to Gaza, traitor!" During a press conference on Tuesday, according to Ynet news, she said: "It was clear from the size of the force that boarded the ship that the purpose was not only to stop this sail, but to cause the largest possible number of fatalities in order to stop such initiatives in the future."